Tickle My Senses: Celebrating Love with "Love Cake" and the 100th Post"
Celebrating Love with "Love Cake" and the 100th Post"
and the Award winning Carribean Fruit Cake. And because this year is so special there is going to be an extra special festive cake, one that comes from across the globe where it is usually made at Christmas, New Year's, weddings and birthdays. 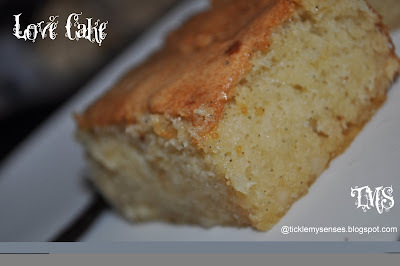 The cake becomes richer in flavour and denser in texture with time. Love Cake keeps well for 2-3 weeks in a tightly covered tin, stored in a cool place but not refrigerated. The cake tastes best after two days. 1. Warm semolina in a dry pan over medium heat until fairly hot to the touch, being careful not to let it brown. 2. Put in a bowl and while still a little warm, mix in softened butter using a wooden spoon. Add lemon rind, spices and salt. Mix well, cover and set aside two to four hours. 3. Separately, mix cashews with rose water, almond extract and vanilla. Cover and set aside. 4. Grease 9-by-13-inch pan and line with three thicknesses of wax paper. Butter well the top layer of paper. 5. In a large bowl, beat yolks and sugar until they have doubled in bulk and become thick, creamy and very light in color. 6. Beat in the semolina-butter mixture, a little at a time. Add the honey and beat. When well beaten, fold in cashew mixture. 7. Beat egg whites with lemon juice until they hold firm peaks. Fold into the cake mixture. 8. Spoon the mix into the prepared pan and bake in a preheated oven at 150C for 50-60 minutes. If the top starts to brown, cover with aluminium foil. Do not use the skewer test to check if it’s ready as this cake is very moist. Instead, lightly jiggle the cake tin and make sure there is no runny batter. 9. Do not remove cake from pan. Let cool completely. While still in pan, cut into small squares. Congrats on your 100th post Caysera!! 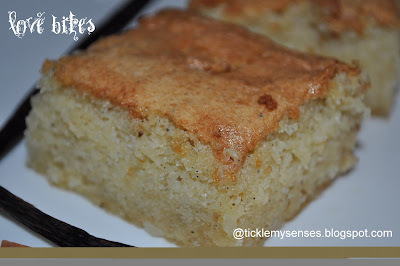 What a coincidence, my friend sent me the recipe of the Srilankan love cake last week..I will be trying it soon! Nice story revolving the origin! And thanks so much for the awards dear, will collect & display it once the Xmas recipe madness is over :) tc!